One bright spot has surfaced in the field of fertility and it started here in St. Louis. The ability to freeze and transplant ovaries is a new option for women facing cancer therapy or for those women who want to delay pregnancy until later years. Dr. Sherman Silber, director of the Infertility Center at St. Luke’s Hospital, made international headlines with research presented this month at the annual meeting of the American Society of Reproductive Medicine (ASRM) held in San Francisco. While the details of this case are intriguing — one twin helping another to achieve motherhood — the real breakthrough, according to Silber, is the science. “We can freeze the ovaries of young women who are going to lose their fertility over time and transplant them back later, and they (the ovaries) won’t have aged,” he said. The breakthrough offers hope for women undergoing reproductively-destructive therapies, such as women with cancer facing chemotherapy or radiation. 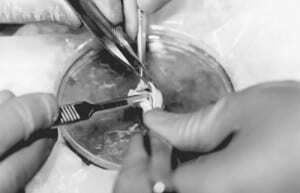 “If we take the ovary out, freeze it, save it and transplant it back later, they will be fertile again,” Silber noted. Dr. Cindy Haines is managing editor of Healthday-Physician’s Briefing and president of Haines Medical Communications Inc., a full-service medical communications and consulting firm. As a board-certified family physician, Haines is well-versed in all areas of health care, with particular interest in fitness, nutrition, and psychological health. You can listen to Dr. Haines’ House Call on KTRS.Her column runs each week in the St. Louis Beacon. To contact her, contact Beacon health editor Sally J. Altman. Listen to Dr. Silber discuss the biological clock, preserving your fertility and egg freezing on the KMOX Health and Fitness Show with Monica Adams. Listen to Dr. Silber and Joan Hamburg discuss the infertility epidemic on WOR Radio in New York.